News headlines warn of rivalries and competing nations across Asia and the Pacific, even as powerful new cross-border relations form as never before. This book looks behind the Asia-Pacific curtain: at the new forms of social, economic, and political integration taking place through a global capitalism that is rife with contradictions, inequality, and crisis. We are moved beyond traditional conceptualizations of the inter-state system with its nation-state competition as the core organizing principle of world capitalism and the principal institutional framework that shapes the makeup of global social forces. These important studies examine and debate over how there is a growing transnationality of material (economic) relations in the global era, as well as an emerging transnationality of many social and class relations. 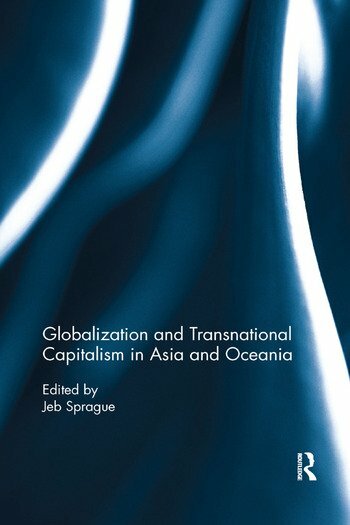 How does transnational capitalist class fractions, new middle strata, and labor undergird globalization in Asia and Oceania? How have states and institutions become entwined with such processes? This book provides insight into a field of dynamic change. Jeb Sprague is in the Department of Sociology at the University of California at Santa Barbara and is a founding member of the Network for Critical Studies of Global Capitalism. View his academic website at: https://sites.google.com/site/jebsprague/.